Abstract. The fast growing calcareous skeletons of zooxanthellate reef corals (z corals) represent unique environmental proxy archives through their oxygen and carbon stable isotope composition (δ18O, δ13C). In addition, the accretion of the skeleton itself is ultimately linked to the environment and responds with variable growth rates (extension rate) and density to environmental changes. Here we present classical proxy data (δ18O, δ13C) in combination with calcification records from 15 massive z corals. The z corals were sampled from four interglacial units of the Florida carbonate platform (USA) dated approximately 3.2, 2.9, 1.8 and 1.2Ma (middle Pliocene to early Pleistocene). The z corals (Solenastrea, Orbicella, Porites) derive from unlithified shallow marine carbonates and were carefully screened for primary preservation suited for proxy analysis. 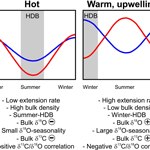 We show that skeletal accretion responded with decreasing overall calcification rates (decreasing extension rate but increasing density) to warmer water temperatures. Under high annual water temperatures, inferred from sub-annually resolved δ18O data, skeletal bulk density was high, but extension rates and overall calcification rates were at a minimum (endmember scenario 1). Maximum skeletal density was reached during the summer season giving rise to a growth band of high density within the annually banded skeletons (“high density band”, HDB). With low mean annual water temperatures (endmember scenario 2), bulk skeletal density was low but extension rates and calcification rates reached a maximum, and under these conditions the HDB formed during winter. Although surface water temperatures in the Western Atlantic warm pool during the interglacials of the late Neogene were ∼ 2°C higher than they are in the present day, intermittent upwelling of cool, nutrient-rich water mitigated water temperatures off south-western Florida and created temporary refuges for z coral growth. Based on the sub-annually resolved δ18O and δ13C records, the duration of the upwelling episodes causing the endmember 2 conditions was variable and lasted from a few years to a number of decades. The episodes of upwelling were interrupted by phases without upwelling (endmember 1) which lasted for at least a few years and led to high surface water temperatures. This variable environment is likely one of the reasons why the coral fauna is dominated by the eurytopic genus Solenastrea, also a genus resistant to high turbidity. Over a period of ∼ 50years, the oldest sub annually resolved proxy record available (3.2Ma) documents a persistent occurrence of the HDB during winter. In contrast, the HDB forms in summer in modern z corals from the Florida reef tract. We suggest this difference should be tested as being the expression of a tendency towards decreasing interglacial upwelling since the middle Pliocene. The number of z coral sclerochronological records for the Plio-Pleistocene is still rather low, however, and requires more data and an improved resolution, through records from additional time slices. Nonetheless, our calcification data from the warm periods of past interglacials may contribute to predicting the effects of future ocean warming on z coral health along the Florida reef tract. The inconsistent timing of the HDB within single coral records or among specimens and time slices is unexpected and contrasts the common practice of establishing chronologies on the basis of the density banding. 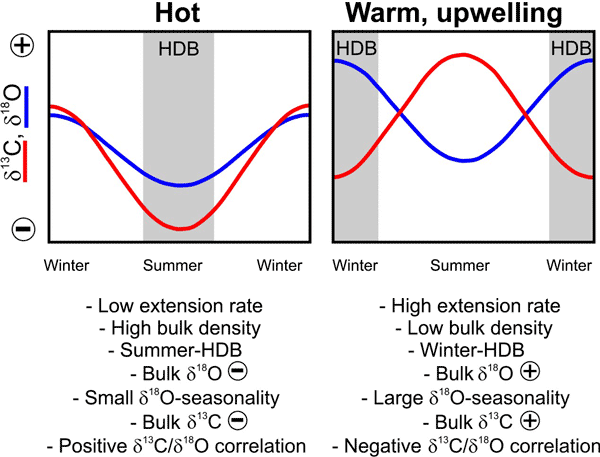 How to cite: Brachert, T. C., Reuter, M., Krüger, S., Kirkerowicz, J., and Klaus, J. S.: Upwellings mitigated Plio-Pleistocene heat stress for reef corals on the Florida platform (USA), Biogeosciences, 13, 1469-1489, https://doi.org/10.5194/bg-13-1469-2016, 2016. We present stable isotope proxy data and calcification records from fossil reef corals. The corals investigated derive from the Florida carbonate platform and are of middle Pliocene to early Pleistocene age. From the data we infer an environment subject to intermittent upwelling on annual to decadal timescales. Calcification rates were enhanced during periods of upwelling. This is likely an effect of dampened SSTs during the upwelling.